The car is available for viewing near Water Pump and Gulistan-e-Johar. One number plate missing. New battery with 4.5 Month warranty remaining. Company maintained. Soundless perfect running condition. Excellent engine. Full original body except one door and touch ups. Right side painted. 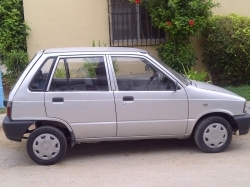 Mehran VX Genuine, company fitted CNG, Engine: 800 cc colour: White in mint condition Number/Registration: Karachi Original Documents with return file, Pioneer CD player with original speakers. Central locking system & New Radial tyres. Good engine condition and ideal for home use. 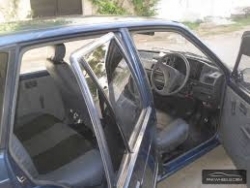 Mehran VX Genuine, company fitted CNG, Engine: 800 cc colour: White in mint condition Number/Registration: Karachi Original Documents with return file, Pioneer CD player with original speakers. Central locking system & New Radial tyres. Spare tyre still un used. Good engine condition and ideal for home use.